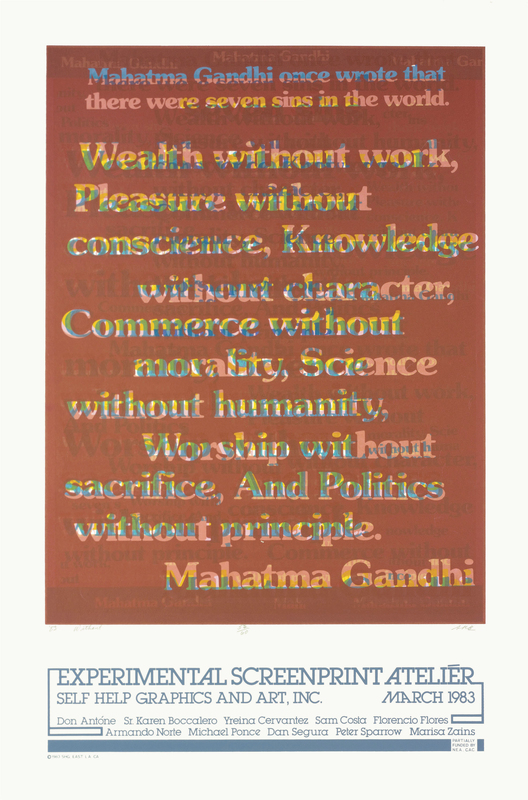 Without presents Mahatma Gandhi's list of the seven sins (often known as the seven blunders) of the world: "Wealth without work, pleasure without conscience, knowledge without character, commerce without morality, science without humanity, worship without sacrifice, and politics without principle." The poster was an advertisement for Self Help Graphics and Art, a printmaking workshop dedicated to supporting the emergent Latino arts community in Los Angeles. "Without." Now Dig This! Art in Black Los Angeles, 1960–1980 Digital Archive. Los Angeles: Hammer Museum, 2016. https://hammer.ucla.edu/now-dig-this/art/without/.